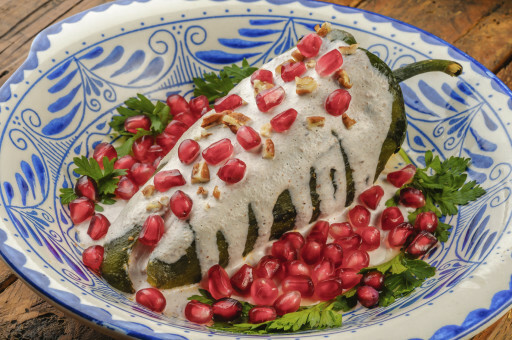 To mark Mexico’s 206th birthday, Coast Packing Company, the leading supplier of animal fat shortenings in the Western U.S. – including the popular VIVA® lard – is breaking out the poblanos in a trio of recipes for Chiles en Nogada, a Mexican Independence Day mainstay. Chiles and Picadillo: Preheat the oven to 300 degrees. Place 1 tablespoon lard in a oven-proof skillet, and heat on medium-high until rippling. Add the cinnamon, cloves and all-spice, toasting for 1 minute. Add the pork roast and sear on all sides until golden brown, about 3 minutes per side. Add 2 cups water and one white onion chopped and simmer for 5 minutes. Put into the preheated oven for 1 hour. Remove from oven and let rest for 30 minutes. Cut pork into a quarter-inch dice. Set aside. Meanwhile, chop all the apple, peaches and plantain into a quarter-inch dice. Soak the golden raisins in the sherry. Set aside. Roast the poblano chiles on an open flame or under the broiler until blistered and blackened — 3 minutes per side if over a flame, 5 minutes per side if under a broiler. Tightly wrap the chiles in a clean dry towel and let them “sweat” for 15 minutes. When chiles are cool enough to handle, gently remove blistered skin. Cut a slit in the side of the chile and carefully remove seeds. Roast the tomatoes on a cast-iron comal or under the broiler until blishered and blackened and so flesh yields to touch. Peel off the skin, core and puree in a blender. Set aside. In a large skillet, on medium-high heat melt butter. Add the chopped pork. Cook until golden brown, about 3 minutes, stirring occasionally. Then add the remaining onion. Cook until the onions are translucent, about 3 more minutes. Add the chopped apple, peaches, plantains, lemon zest and rasins and continue to cook for 5 minutes. Finally add the tomato puree, salt to taste and simmer on low for 15 minutes, stirring occasionally. Taste and adjust seasonings. Stuff each chile with about 1/4 cup picadillo filling, so the chiles are full but not bursting at the seams. Sauce: Soak the walnuts in the milk overnight. Place the walnuts, milk, sherry, queso fresco, salt and sugar in a blender and blend until a smooth, slightly thick sauce forms. If you prefer a thin sauce add more milk. 1. To prepare the picadillo: Melt the lard in a skillet over medium heat. Add the onion and stir to coat in the lard. Cook until translucent, about 3 to 5 minutes. Add the garlic and stir constantly so it doesn’t burn, cooking until aromatic, about 30 seconds to a minute. Add the chopped meat and cook uncovered, stirring occasionally, until the meat changes color and has mostly cooked. Then pour in the tomato sauce and bring to a boil. Add raisins, fruit, spices, nuts, dried pineapple and spices, and a little salt to taste. Bring to another boil, then simmer for at least 30 minutes on low, keeping the pot covered. Taste for more salt. The picadillo can be prepared up to two days before and stored in the refrigerator, or even longer and frozen. Keep the picadillo warm while you’re finishing with the rest of the steps. comal. Wrap chiles in dish towels for about 20 minutes until the skin softens and is easier to peel. Working one chile at a time, remove the skin with the pads of your thumbs or a paper towel. Try not to scrape the skin off with your fingernails — not only does the skin gets under your nails, where it’s difficult to remove, but it mutes some of that yummy charred flavor. (Do not rinse the chiles under water for the same reason!) The chiles don’t need to be perfect. A few pieces of skin left over is okay. After you skin the peppers, cut an incision in the chile (the thinnest/weakest part of the chile is usually best) from tip to end, leaving about an inch of space on either side so the filling doesn’t fall out. Then carefully remove the seeds, either using gloved hands or a small spoon. Try very hard not to scrape, or else you could end up dislodging a vein, and the chile will fall apart. Set all charred, peeled, and seeded chiles aside. 3. To stuff the chiles: Fill each chile with picadillo until they’re plump, but not impossible to close. The idea is that your filling will stay inside and not fall out while the chile is cooking. After filling all the chiles, dust them each in flour. Let them sit for a minute while you prepare the capeado. 4. For the capeado: If the beaten whites sit around for too long, they’ll fall, which destroys the texture of the capeado. So I’d start heating the oil to fry your chiles while you beat the whites. I used a 10-inch skillet and about 1/2 cup of oil. While the oil warms, beat the whites until they’re thick and fluffy and they stay in place even after you turn the bowl upside-down. Then, one by one, stir in the yolks, mixing just until the yolk is completely integrated. Hopefully by this time the oil is hot hot hot, so when you drop in a teensy piece of egg batter, it sizzles. 5. To fry the chiles (the chiles fry very quickly and they’ll burn if you don’t have a constant eye on them): Prepare a baking sheet lined with several layers of paper towels, and have a large cooking spoon and two spatulas at the ready. Hold one flour-dusted chile by its stem and upper edge and carefully dunk it into your bowl of egg batter. (Sometimes a scooping motion works best.) Then quickly place the chile in the hot pan of oil. It should bubble and sizzle immediately. Slather on a little extra egg batter on top so you no longer see any of the chile’s green skin. Once the chile is completely swaddled in egg batter, use a spoon to bathe the chile in extra oil from the pan, until the chile turns a light golden-brown. This should take perhaps 10 seconds. Then use two spatulas — one for each side of the chile — to carefully turn the chile over, wrapping its eggy coat around itself, so it cooks on the other side. Cook for about 10 to 20 seconds more on the other side and remove to the paper-towel lined tray. Repeat with other chiles, adding more oil as needed. Let chiles rest while you prepare the sauce. 6. To prepare the Nogada sauce: I did this in batches. Place 2 cups of walnuts in the blender jar with half the goat cheese, 1/4 cup milk and 1 tablespoon sugar. Blend on high, stopping a few times to stir and dislodge the walnut bits from the blender blades. Add one more tablespoon of milk or a little more if necessary. (You don’t want the sauce too watery or thin.) You could also add more sugar if you want the sauce sweeter — I like mine on the savory side. Finally, add 1 tablespoon of sherry and blend just a little more to combine. Pour into a receptacle and repeat with the other two cups of walnuts, and the rest of the goat cheese, sugar and sherry. 7. To serve: Place a chile on a plate. Ladle over the Nogada sauce, until the chile is completely obscured. Sprinkle with parsley and pomegranate seeds. Serve at room temperature. Traditionally made in Puebla to celebrate Mexican Independence Day on September 16, these chiles have a minced pork filling enhanced with chopped fruit, and a creamy walnut sauce. 1. Make the filling: Bring pork, 2 whole cloves garlic, half the onion, and 2 cups water to a boil in a 4-qt. saucepan over medium-high heat; season with salt, reduce heat to medium-low, and cook, covered, until pork is tender, about 1 hour. Transfer pork to a cutting board, and pour cooking liquid through a fine strainer into a bowl; reserve ½ cup cooking liquid, and discard any remaining along with solids. Once cool, finely chop pork, and set aside with cooking liquid. Return saucepan to medium-high heat, and add lard; finely chop remaining onion, and add to pan along with minced garlic, and cook, stirring, until soft, about 8 minutes. Add parsley and tomatoes, and cook, stirring, until tomatoes break down, about 5 minutes. Return pork and cooking liquid to pan along with raisins, almonds, apple, pear, peach, and plantain, and cook, stirring occasionally, until fruit is cooked through and mixture is thick, about 10 minutes. Remove from heat, and season with salt; set aside. 2. Make the walnut sauce: Place walnuts in a 2-qt. saucepan, and cover with water; bring to a boil, and cook for 5 minutes. Drain, and use a stiff-bristled brush to peel away most of the skin from walnuts; set aside. Bring milk to just under a boil in a 2-qt. saucepan over medium-high heat, and add walnuts; let sit, covered, to soften nuts, about 30 minutes. Transfer walnuts and milk to a blender along with queso fresco, crema, sherry, and sugar, and puree until very smooth and thick, at least 2 minutes. Season with salt, and transfer to a bowl; cover and refrigerate until ready to use. 3. For the chiles: Heat broiler to high. Place poblano chiles on a foil-lined baking sheet and broil, turning, until blackened all over, about 20 minutes. Transfer chiles to a bowl, and let cool. Peel and discard skins, stems, and seeds, and cut a slit down the length of each chile. Remove and discard seeds and ribs, keeping chile intact. Place about 2-3 tbsp. filling inside each chile, and close chile around filling to form a tight roll. Refrigerate until ready to use. 4. Heat oil in a 12″ skillet over medium-high heat. Meanwhile, place flour on a shallow plate, and set aside. Beat egg whites in a bowl until soft peaks form; whisk in egg yolks, salt, and vinegar. Working in batches, dredge each chile in flour, shaking off excess, and then coat in egg batter. Place in oil, and fry, flipping once, until golden brown and filling is heated through, about 5 minutes. Using a slotted spoon, transfer chiles to a wire rack to drain. Transfer to serving plates, and spoon walnut sauce over chiles to cover completely; sprinkle with pomegranate seeds before serving.